Boston has benefited from an unexpected positive development in the last decade. Where we used to be simply the Hub of Biotech, we have suddenly turned into the Hub of the (Big) Pharma Universe. How did this come to pass? Boston has historically been home to the best research universities, and the most innovative startup and mature biotechs. All of a sudden, during the last decade, things changed. Large pharma bet big on Boston: Many of the top 20 international pharmaceutical companies established research (and in some cases, corporate) headquarters in the Boston area. The explosive growth that comes with a transformation from merely a research capital to a center of corporate expansion and development is key to the Boston area’s ability to achieve its own goals — to add more solid middle-class jobs such as lab technicians, sales and marketing managers, and administrative assistants to the ranks of scientists and entrepreneurs. Thus, the evolution from biotech to pharma capital is one that other innovation-based industries should be monitoring. And while every industry follows its own path, there seems to be a connection between keeping smaller firms and startups in Boston, where they then get acquired by larger firms who like the area enough to expand here. And, in other cases, the large firms simply sensed that it was better to have their corporate decision-makers in the same place where the most innovative drugs were in the early stages of development. GlaxoSmithKline, for example, just announced the establishment of an innovation center in Boston. In the early 2000s, major Swiss multinational Novartis decided to relocate its entire research function to Cambridge. The German pharmaceutical multinational Merck Serono chose to locate its US headquarters in Massachusetts. The American pharma giant Merck built a beautiful new building and moved a significant portion of its innovative research to the Harvard Medical School campus in Boston. Takeda, the leading Japanese pharmaceutical firm, bought Millennium, and based its entire oncology efforts in Cambridge. Sanofi, the top Franco-German pharma company, decided in 2008 to become a major player in rare disease therapies, and bought one of the largest and most successful Boston biotechs, Genzyme. Subsequently, Sanofi has invested heavily in its Boston presence, and in the Genzyme platform and brand. Pfizer just a few months ago moved over 1,000 researchers and drug developers to the heart of Cambridge. Global pharma companies have also spent the last decade acquiring innovative small Boston biotechs. Merck recently announced the purchase, for about $4 billion, of Idenix, a small Cambridge biotech with promising hepatitis C drugs in development. One of the largest global pharmaceutical companies, Johnson & Johnson, has quietly acquired a slew of Boston-based biotechs over the last decade, and recently established an innovation center in Cambridge. Genzyme (now a key part of Sanofi) earlier this year made a $700 million bet on a new drug technology, RNA interference, and the leading company in the space, Alnylam, based in Cambridge. 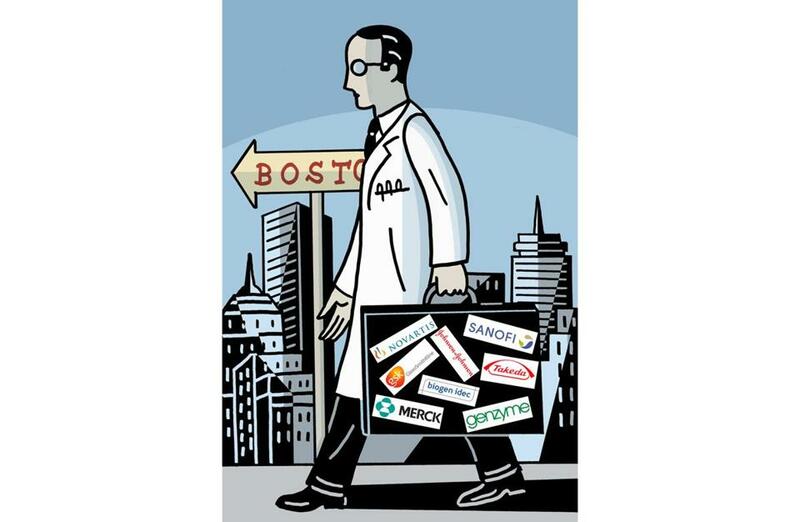 How has Boston changed, in morphing from Biotech Hub to Pharma Hub? For one thing, entirely new skills have become resident in Boston. Where we used to be world class mainly in science and drug discovery, we now enjoy the presence of the world’s best drug developers — those able to direct clinical development, all the way through approval of a pharmaceutical by the FDA, and launch of a drug in the marketplace. In the past, most Boston biotechs focused on discovering important new drugs. Today, Boston plays a major role along the entire value chain from discovery, through drug development and marketing. Boston has changed a great deal in the last decade, and is much better off with the recent influx of highly skilled and talented pharmaceutical employees and executives. This new, more vibrant environment, with a deeper bench of pharmaceutical talent, should continue to help us invent an outsize share of the transformative medicines of the future. Not a week now goes by without the CEO of a major pharmaceutical company visiting our city. In fact, just recently, the CEO of Sanofi announced that he was moving to Boston: Red Sox fans at Fenway Park saw the large centerfield sign welcoming Sanofi CEO Chris Viehbacher. The Boston experience with biotech and pharma shows that economic growth here has been driven by both successful smaller biotech firms, and by the leading local universities. There may be other industries that could follow this path to Massachusetts — software and Internet infrastructure come to mind. Perhaps these industries could reach a tipping point where global companies also feel they need Boston as a base for operations. We often hear of obstacles that might face large companies when considering Boston as a growth platform — high costs for labor, taxes, and rent. But Boston has shown that, in the global competition for biotech and pharmaceutical jobs, we can compete successfully. Other cities that vie with us — San Francisco, London, Paris, the New York/New Jersey region, cities in Switzerland or Germany — often have more significant hurdles of their own. In health care, we have shown that Boston can be a key global player. We look forward to the day when this is also true for other innovation-based industries. Dr. Christoph Westphal is a partner at Longwood Fund, which founds and invests in biomedical companies, and is a part of Boston Biotech Conference. Follow him on Twitter @drcwestphal.